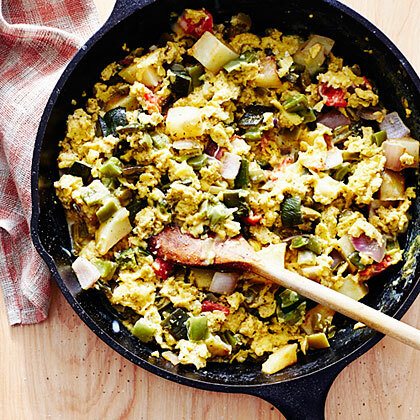 This easy breakfast or supper dish takes a cue from Mexico, where nopales are popular with eggs, and from America, where we like to add roasted potatoes. Preheat oven to 475°. Line a sheet pan with parchment paper. On parchment, toss potato, onion, 1/2 tbsp. oil, and 1/4 tsp. salt. Set chile and tomato in corner of sheet pan. Bake, turning vegetables once, until browned, about 20 minutes. In a frying pan, sauté nopales over high heat with 1/2 tbsp. oil and 1/4 tsp. salt until pan is mostly dry, 3 to 6 minutes, then reduce heat and cook until barely tender, 3 to 4 minutes more. Set aside. Peel, stem, and seed chile; peel tomato. Chop both. In a bowl, whisk eggs with remaining 1/4 tsp. salt and the pepper. Heat a large skillet over medium-high heat. Add remaining 2 tbsp. oil and the cumin; cook until fragrant, 1 minute. Stir in potato mixture, chile, tomato, and nopales. Cook until hot. Pour in eggs and cook, stirring often, until set, 3 minutes. Sprinkle cheese on top; stir a few times until it melts. Serve with hot sauce.